Sometimes the art in Spider-Man comics doesn’t quite line up with his reputation as a slick, stylish, dignified hero. When people say Spider-Man 4 must above all else be true to the comics, they should perhaps be pointed to this collection. 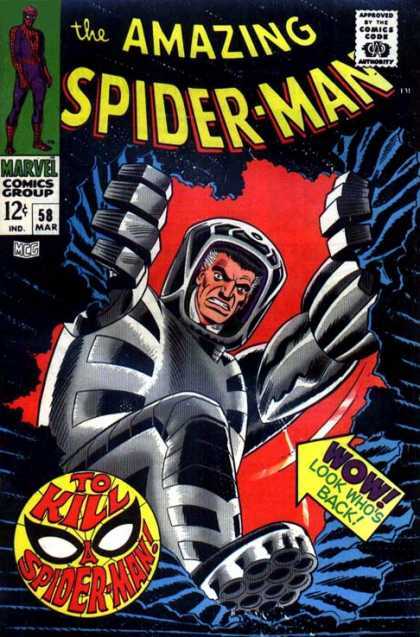 Here are Marvel’s top 15 most ridiculous Spider-Man comic covers. All real. why does a frog need coils on its feet heh? The Hypno Hustler is great. I want him in Spider-Man 4, and Mysterio in 5. Ok, that’s pretty bad, but not quite as bad as The Amazing Spider-Man 183.
there are some pretty bad covers right there…but i don’t know how you managesd to do FIFTEEN without including peter porker, spectacular spider-ham! p.s. doc ock marrying aunt may is AWESOME! You’re absolutely right, I will add him in shortly. I’d have the one with Obama at #3 at least…. Good call. I don’t think it even existed when I drew up this list, but it’s going in now.